We invent, design, build, and implement workforce optimization solutions for specialty retailers. We believe that service matters, payroll is an investment, and employees are essential to brand profitability. We build long-term, win-win partnerships to help you deliver your brand promise. We think like retailers because we are retailers. Matrix was founded in 2005 by experienced retailers who have built tools that have written millions and millions of schedules. Our retail experience has helped us develop solutions and approaches that address the unique challenges and opportunities of specialty retail, while also differentiating us in the marketplace. Labor optimization is where most of the value is. Labor optimization is not just about effectively deploying payroll hours each week. 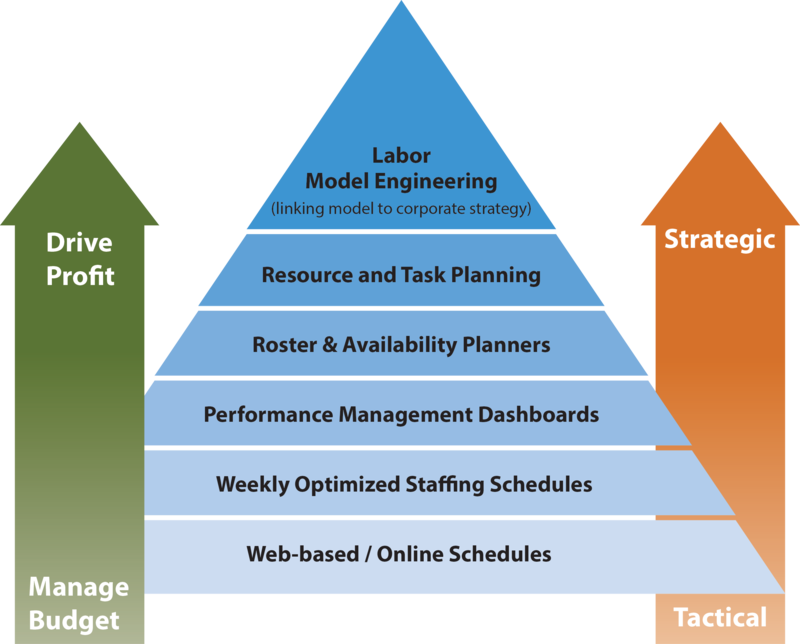 It starts with understanding high-level corporate strategy and the role employee behaviors play in executing the strategy. From there, it’s about engineering a labor model that places every hour where it will deliver the most return. Our multivariate regression forecaster accurately predicts labor demand (by hour) by understanding each store’s unique reaction to marketing, seasonality, calendar shifts and calendar events. We are able to create store-specific forecasts at the hour-level for multiple labor drivers (sales, traffic, units, transactions, etc.). Truly optimized schedules are built from the ground up based on the optimal amount of labor required for the actual work being performed each hour. Our schedule optimizer applies engineered labor standards to the demand forecast each hour to have the right number of employees to perform the behaviors to convert customers. Solutions as a service means faster implementation and faster results. It also means clients are always using the latest version of software (you don’t have to pay for upgrades). And we don’t just implement software and then walk away, because “service matters” not just with customers, but also with business relationships. We operate more like advisors or partners than as a vendor. If labor optimization is our “Best At”, then our “Win At” is creating user interfaces that enable managers to create schedules with little to no training. We add value to our client partnerships by helping to deliver a healthier P&L by putting the exact amount of labor precisely where it is needed. We have helped clients increase top-line sales, decrease payroll expense, and sometimes both simultaneously. To do this well requires specific capabilities. We link sophisticated technology to simple interfaces to provide the tools and information to help manage and optimize your workforce. Our solutions range from tactical tools for managing payroll budget, to strategic planning tools to drive profitable sales. We recognize that different companies have different needs in regards to labor optimization. What might be important to one company, may not be a priority for another. Help us help you by giving us insight into your priorities. Select any of the items below that are the most immediate opportunities in your efforts to get the most return out of every payroll hour.